Baden Pailthorpe, 'Clanger' (installation view). UTS Gallery. Photo: Jessica Maurer. The red-and-white faithful cheer on the Sydney Swans every week – and the passion they have for the Club has in recent weeks been laid bare in an artwork at UTS. A piece of art named ‘Clanger’ by 3D artist and long-time Swans fan Baden Pailthorpe was on show at UTS Gallery until Friday. The project was based on Sydney’s match against Carlton in Round 23 last year in which star forward Lance Franklin booted 10 goals to inspire the Swans to an 81-point win at the SCG. 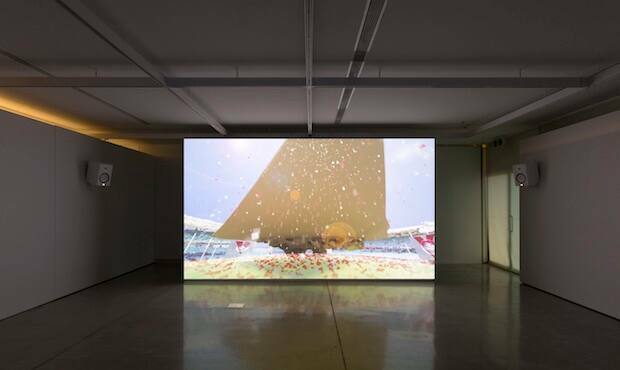 The artwork consists of two components that are both projected off a wall, one of the players appearing as a cross between a fairy-tale-like video game and a warplane and the other of the seesaw between the crowd and game of football. Pailthorpe used player information drawn from small data-filled packs they wear in their guernseys to construct a 3D animation of anonymous players. He also used audio data to paint a picture of the to-and-fro connection between fans and the game, resulting in a montage of a cheering crowd, the umpire’s whistle and the Swans’ Club song complemented with visuals on the screen. Pailthorpe said he wanted to uncover the relationship between the game and crowd to show the action-reaction connection. “The crowd at the footy just wants to watch the footy,” Pailthorpe said. “They’re not really concerned about data and stats.